Chinese Vice President Wang Qishan will visit Switzerland and attend the World Economic Forum (WEF) annual meeting in Davos from Jan. 21 to 24, a Foreign Ministry spokesperson announced Monday. China has played a unique and constructive role in safeguarding peace and promoting security in Africa, said Chinese State Councilor and Foreign Minister Wang Yi in Ouagadougou on Friday during a joint press conference with his Burkina Faso counterpart Alpha Barry. State Councilor and Foreign Minister Wang Yi countered criticism on Thursday alleging that Chinese aid had contributed to a massive increase in African countries' debt. On the contrary, he said, China is helping the continent seek independent and sustainable economic growth. China's foreign ministry on Friday refuted a travel advisory issued by the United States, and said China always welcomes foreign citizens and protects their lawful rights. China said on Wednesday it hoped that the Democratic People's Republic of Korea (DPRK) and the United States would respect and accommodate each other's reasonable concerns to achieve progress in the denuclearization of and establishing a peace mechanism on the Korean Peninsula in the new year. China has lodged solemn representations with the U.S. over a newly approved law that calls for strengthened official contact and military links between the U.S. and Taiwan. ​China stands ready to work with the United States to move forward the China-U.S. ties which are underpinned by coordination, cooperation and stability, a Chinese Foreign Ministry spokesperson said on Sunday. A Canadian citizen will face trial over drug-smuggling charges in China's northeastern Liaoning province on Saturday, amid media reports of another Canadian, who was earlier detained for "working illegally" in China, being released. ​A Chinese Foreign Ministry spokesperson on Friday applauded the Maldivian Foreign Minister Abdulla Shahid's remarks that the Maldives will continue to work with China under the framework of the Belt and Road Initiative (BRI). 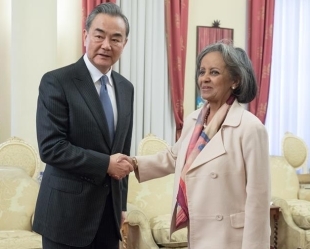 ​Chinese State Councilor and Foreign Minister Wang Yi will pay an official visit to Ethiopia and the African Union (AU) Headquarters in Addis Ababa, Burkina Faso, Gambia and Senegal from Jan. 2 to 6, 2019.